HP Cone Crusher belongs to a kind of high-tech crusher to meet the requirements of developed countries. It uses a computer optimization design to speed up the spindle speed. Advanced crushing chamber replacement system can quickly replace components to meet the size requirements of different thickness. The HP Hydraulic Cone Crusher uses a unique design and a patented technology about eccentric bushing rotating around the fixed shaft. "Labyrinth seal system" is unique in the HP series cone crusher, which makes it more reasonable and more reliable. 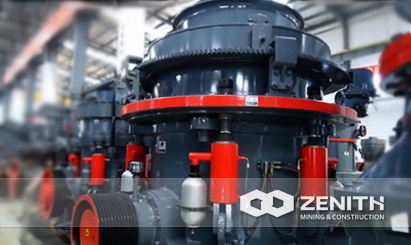 Compared with spring and traditional cone crushers, ZENITH's HP series cone crusher has more advantages like easier operation, larger application scope, and more reliable performance. 1. High crushing ratio and production efficiency. 2. Less spare part consumption and low operation cost. 4. Hydraulic protection and hydraulic clearing, high automatization and less production stop and repairing time. 5. Dilute oil lubrication makes the service time increase. 7. Easy maintenance and operation. 8. The crusher can provide customers a higher capacity, better product shape, and is easy to be operated.